VANCOUVER, BRITISH COLUMBIA – (April 24th, 2017) -Power Metals Corp. (“Power Metals Corp.” or the “Company”) (TSX VENTURE:PWM)(FRANKFURT:OAA1) is pleased to announce the upcoming drill and work programs for the Company’s hard rock lithium properties. “This is a very busy time for Power Metals as we are now entering an exciting period of work and drilling which can very quickly prove up the value of our assets. Additionally, we will be providing shareholders with further details on the recently announced Plan of Arrangement to Spin-Out the hard rock assets and the upcoming work programs on our petro-lithium assets,” comments Johnathan More, Chairman of Power Metals. The Paterson Lake Property is located 75 km north of Kenora, northwestern Ontario. The Paterson Lake Property is located within the Separation Lake Greenstone Belt which hosts the Separation Rapids Pegmatite Field. The Separation Rapids Pegmatite Field is known to contain numerous petalite pegmatites including the Big Whopper, Big Mack and Marko’s pegmatites. Power Metals summer 2017 exploration program on the Paterson Lake Property will consist of geological mapping, trenching and channel sampling to investigate the approximately 50 pegmatite exposures on the Property and the westerly extension of the Marko’s pegmatite onto Power Metals Property. The geological mapping will also follow the three parallel 70° trends of known petalite pegmatite dykes in search of additional dykes. The geological mapping will be followed by 800 m of drilling for approximately 8 drill holes on selected overlapping ten lithogeochemistry and six enzyme leach soil anomalies historically identified but barely explored. The Gullwing – Tot Lake Property is located 30 km northeast of Dryden, northwestern Ontario. The Property consists of multiple pegmatite dykes including: Gullwing Lake spodumene pegmatite swarm, Tot Lake spodumene pegmatite, Coates beryl-molybdenite pegmatite hosted by the Wabigoon Greenstone Belt and about 15 Rb-Cs pegmatite exposures hosted by granite located in the Drope township area. The Gullwing Lake pegmatite swarm consists of a cluster of over 20 spodumene pegmatites identified in outcrop along the southeastern shore of Gullwing Lake. The largest pegmatite in the swarm is the Sleeping Giant Pegmatite is at least 415 m long. Tot Lake pegmatite is a spodumene-subtype pegmatite which is almost 50 m long. Tot Lake pegmatite is one of the few pollucite occurrences in Ontario indicating a very high degree of fractionation. Power Metals summer 2017 exploration program on the Gullwing – Tot Lake Property will consist of geological mapping, trenching and channel sampling to investigate the multiple pegmatite dykes on the Property. 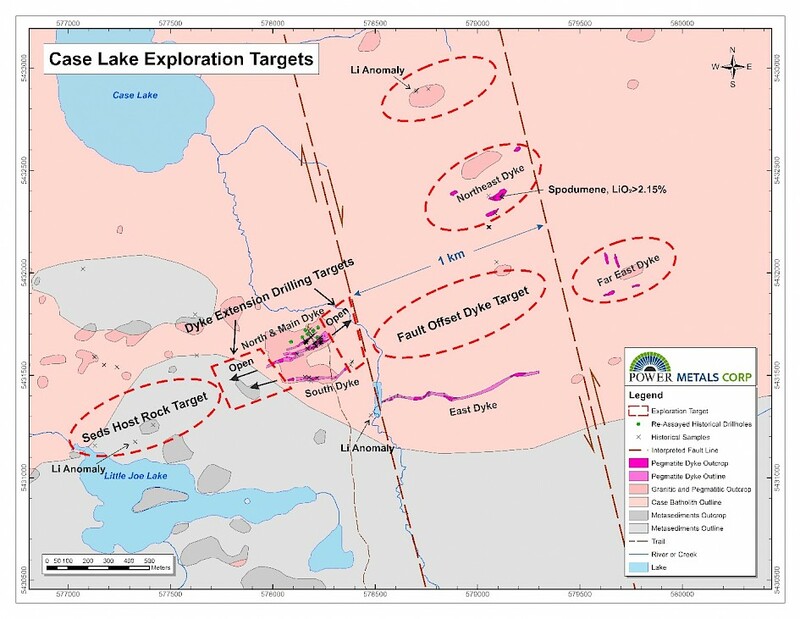 The geological mapping will also explore the possibility of additional pegmatites being found over the 5 km between the Gullwing Lake pegmatite swarm and the highly-fractionated Tot Lake pegmatite. The geological mapping will be followed by 1,000 m of drilling for approximately 8 drill holes on selected exploration targets. Power Metals Corp is one of Canada’s newest premier mining companies with a mandate to explore, develop and acquire high quality mining projects for minerals contributing to power. We are committed to building an arsenal of projects in both lithium and other clean power fuels. We see an unprecedented opportunity to supply the staggering growth of the lithium battery industry.